Please refer to our stock # HKBBcnsx4 when inquiring. Hocking made the Bubble pattern between 1934-65. 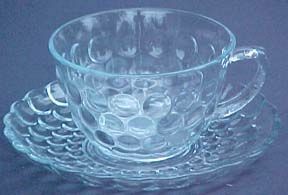 These sapphire blue Cup & Saucer are in excellent condition. Two are available.